Ghazi University DG Khan Admission 2019 are now open for all the undergraduate, post-graduate, mphil and phd programs in all the subjects that they offers. 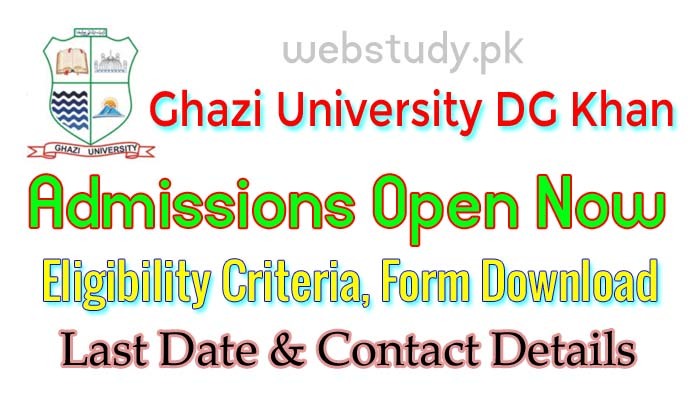 All the students who are going to apply for Admission in Ghazi University 2019 should know about eligibility criteria, admission processing fee and entry test etc and here at webstudy.pk all information like Ghazi University Admission 2019 Last Date, Fee structure, Advertisement, Admission Criteria, Merit list schedule. Ghazi University is one of the university that came into being in PMLN govt era and it is doing very well job to provide students with quality education. Ghazi University is located in Dera Ghazi Khan and hence its name is Ghazi University. It offers admission twice a year in which thousands of students apply for admission but there are only limited seats so only brilliant and lucky ones are granted with admission. Ghazi University DG Khan was established in 2012 by Govt of the Punjab and it is located in small city Dera ghazi Khan. It is a public secter and HEC recognized institute that have all the facilities for students so that they can study in a very comfortable environment. Ghazi University offeres Programs and courses that have HEC recognization and also have world wide reputation. There is 100% job placement gurantee after you got degree from Ghazi University. www.gudgk.edu.pk is official website of this university from where you can get download Admission form, advertisement, fee structure 2019 details and much more. It provides well educated faculty, highly trained staff, airy classrooms, computer laboratories, play grounds, greeny lawns, library and much more. There is latest analytical equipment in labs and new collection of books in the library. Ghazi university offers admission on 100% merit and its eligibility criteria is written below. Only the students who will meet the eligibility criteria will be selected. Intermediate with minimum 45% marks and there are 20 extra marks for Hafiz e Quran. Candidates having 2.5 CGPA out of 4.0 in graduation are eligible to submit application form or having 2nd Division in BA, BSc are eligible. Candidates who wants to apply for ghazi university dg khan spring admission 2019 should walk through university campus and have to buy prospectus that contains university information, rules and regulations, guide and a application form. You have to fill that application form and submit admission processing fee into the bank. Attach all the required documents along with bank challan copy and submit the application form to the admission office. Ghazi University DG Khan also provide financial assistance to the students who are deserving and need some aid from institute. Eligible and brilliant students will get scholarships of PEEF, MORA, USAID, HEC and need base scholarships. There is a special scholarship and fee discount for sprots men.